Dylan had a “Film Festival” at school last week. Each kid in his class made a movie about a favorite topic. Up there with the “Happy Birthday” song, Dylan’s favorite thing is marine life. He LOVES all different kinds of whales, dolphins and seals. He visits Sea World about 3-4 times per month, and the cast of their shows even recognize him when he comes because he’s such a regular. 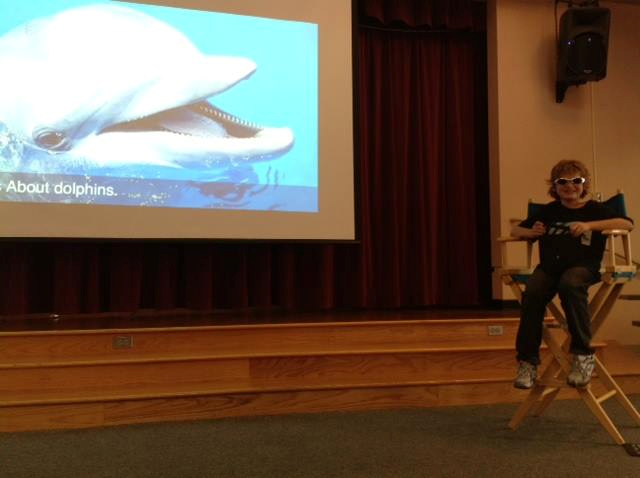 Anyways… Dylan’s movie was a slideshow of pictures with a voice over of him reading facts he’d written about dolphins. I wasn’t there to see it in person, but my guess is that he was pretty excited to share his movie with his classmates. First he gives an introduction, “My name is Dylan […] I like swimming and doing crafts. I enjoy swimming and running.” Then he tells the audience all about dolphins: “Dolphins have 2 flippers. They have 1 tail. They have 1 dorsal fin. Dolphins have very smooth skin.” He goes on to share how to care for dolphins, where dolphins live, and shows they perform in at Sea World. Can I just say….this little guy amazes me LITERALLY every time I see him.